Richard Claywell was a panelist on two recent Financial Poise webinars and both are now available On Demand. The first was Where Did All My Profits Go? Mastering the Concept of Working Capital. 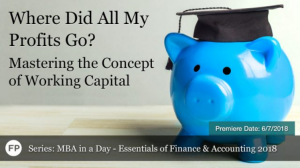 Part of the Financial Poise MBA in a Day Series, this webinar helps clarify what parts of the balance sheet make up working capital and what actions cause the most issues with cash flow. Richard and the other panelists also cover best practices for managing working capital and how to avoid negative impacts to cash flow and tax acceleration. 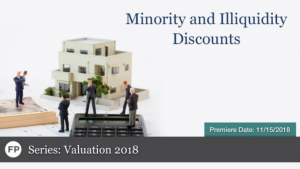 The second was part of the Valuation 2018 Series and covered Minority and Illiquidity Discounts. This webinar delves into those situations where the share of ownership in a company must be discounted due to difficulty in finding a buyer. Liquidation costs of equity in private businesses may be substantial, and the equity’s value is discounted for that potential illiquidity. Likewise, partial ownership of a private firm may be worth less than a proportional share of the total business. Richard and the other panelists discuss these types of discounts and how they may impact the valuation of your asset.